My First ABC Kids seems to have one goal in mind - to teach young children the alphabet, including the letter names and some basic spellings. 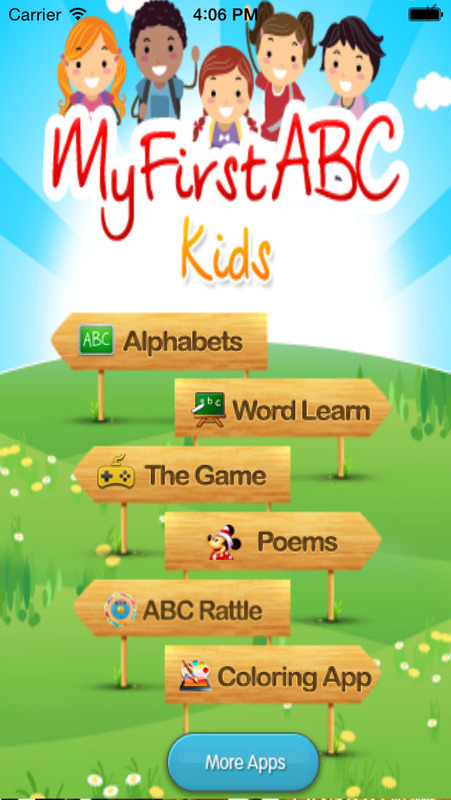 A simple app for practising the alphabet. My First ABC Kids seems to have one goal in mind - to teach young children the alphabet, including the letter names and some basic spellings. It is easy to use and features moderately appealing graphics, but rather misses the mark in terms of the standard literacy curriculum. The app consists of four main activities but the main menu also contains two links to other apps from the developer, without making the distinction clear. This, along with the very frequent pop-ups requesting a rating for the app, would make it more difficult to leave a young child to use the app in a self-directed way. 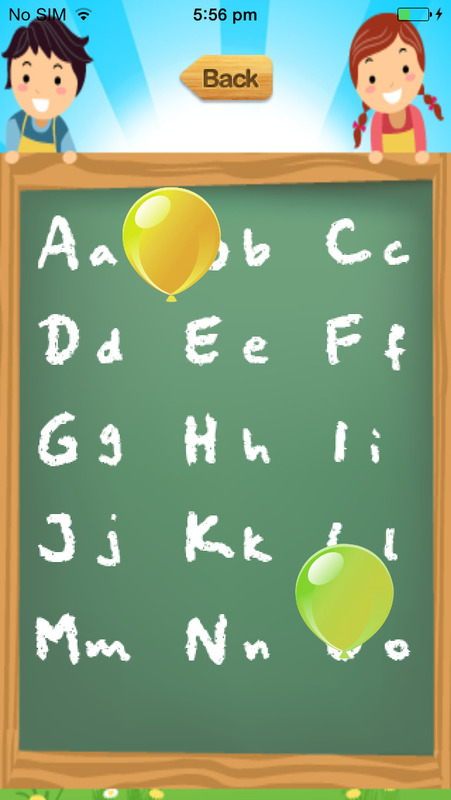 The first activity, “Alphabets”, is very clearly laid-out, with each of the letters of the alphabet shown in both lower and upper case form on a blackboard graphic. This makes it very easy to navigate, which is obviously a plus given the target audience. Once the letter is clicked, a new graphic appears showing a picture of something beginning with that letter, along with a label showing its spelling - for example, “umbrella” for U. 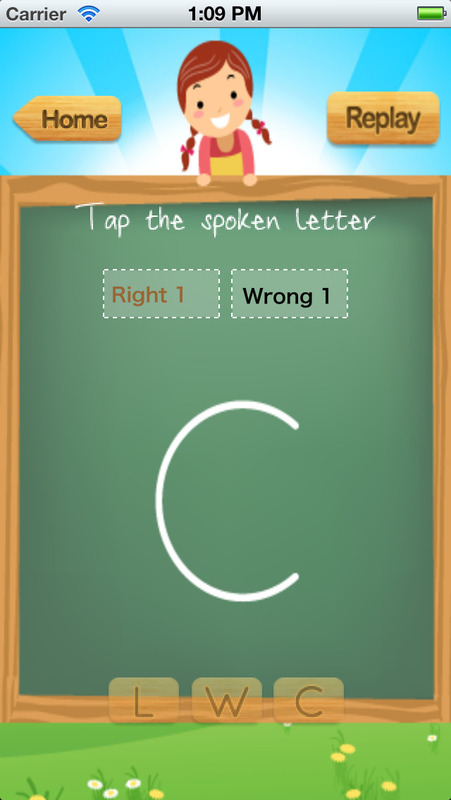 The learner can click on different parts of the graphic to hear the word or letter spoken, or can choose to practise writing the letter from this screen - giving them a chance to trace letters with their finger on the screen. This is a good feature for those beginning to learn to write, although there is no feedback or way of keeping track of which letters have been practised. The “Word Learn” section maintains a similar layout, providing consistency to the user - and this time spells out words using their letter names. This section requires no user input and so offers no opportunity for assessment, although it would be easy for a learner to work their way through the alphabet on their own. “The Game” activity is a simple but effective multiple choice assessment that speaks a letter to match with its symbol. It keeps track of scores whilst the learner is using the game, but resets once they leave and offers no indication of which letters they are particularly strong or weak on. That said, as a quick tool for practising letter names, this could prove useful. The last section, “Poems”, contains a few songs for children to listen to. These are not specifically related to the alphabet, although could be used within the context of promoting literacy in general. Overall, this app does provide some educational value for children who are beginning to learn the alphabetical letter names. However, within schools, this learning normally takes place long after children have used a phonics-based system to start to read and write, by which time they can already form letters, spell words and read simple words competently. As such, this app seems to be targeting a younger audience that it is actually suitable for. 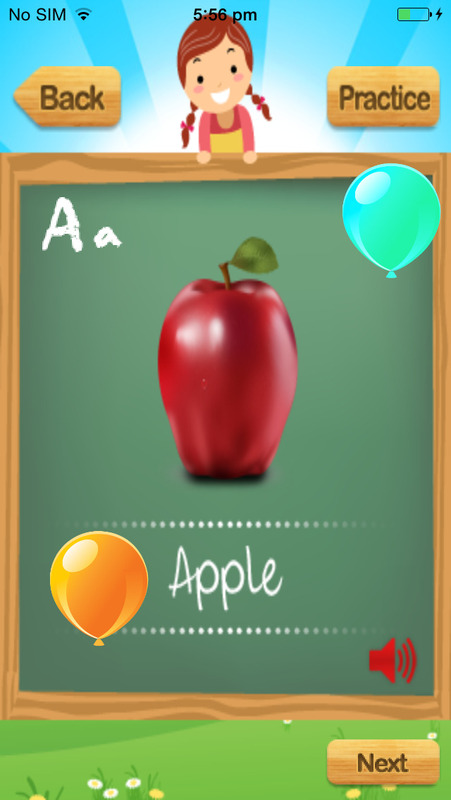 -- A Game (for kids to listen to the ABC alphabets and select the correct alphabets). -- Word Learn - Learn to spell Words. A good collection of starting words and the app teaches how to spell the words. -- Poems - Good collection of classical Nursery Rhymes. Sing along with your Kids. -- Balloons Popping is great fun for kids. See them watch and try to pop the Balloons as they learn. This interactive application uses sounds and pictures to memorize the alphabets, sounds help in learning pronouncing of letters where as pictures help you to recognition of letters. -- More than one picture to memorize alphabets.